A lot happens at a home or business while you’re not there that doesn’t require a police or fire department response. With Alarm.com, you can keep track of all security system issues that happen at your home or business: see when the kids get back from school, when the dog walker arrives, or make sure those tiny fingers stay out of the medicine and liquor cabinets. Alarm.com-enabled security systems will keep track of sensitive drawers and storage areas at your office, allow you to find out when the first employee arrives and when the last one leaves for the day. Just log in to our website from your Windows PC, MAC or mobile phone and you’ll find detailed motion activity reports stored securely online for 60 days. With Alarm.com, you have complete control over security and what matters most to you. If you have an Android phone, we've got you covered. Our newest mobile app, compatible with leading Android devices will keep you connected while you're on the go. The dynamic and intuitive interface makes this app an incredibly easy and convenient way to monitor and control your Alarm.com home or business security system. The Alarm.com app for Android devices is another way Alarm.com continues to invent the newest technology in next-generation security systems. 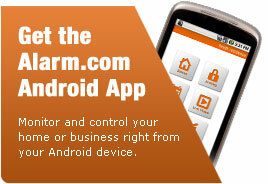 Search for 'Alarm.com' in the Android Market on your compatible Android device to download it now. Check on system status and motion activity at your property. Remotely arm or disarm your system. Watch live video feeds and view stored clips. Access a complete, searchable history of system and alarm events. Control the lights at your property. The kids get home from school. The handyman arrives and leaves. A water leak erupts in the basement. The garage door is left open. The liquor, gun or medicine cabinet opens. The pool gate is left open. Someone forgot to turn off the lights. You can also receive real-time email and text message notifications right to your Android device to find out about any system event that matters to you. The Alarm.com app is compatible with Android devices with OS 1.6 or later. Leading compatible Android devices include Google Nexus One, HTC Dream (G1), HTC Magic (myTouch), Motorola Droid, and Motorola Milestone models. * Functionality varies depending on your Alarm.com service plan.